In 2010, Jupiter's South Equatorial Belt essentially disappeared, although no one knows why. As a result, the Great Red Spot on Jupiter became much easier to see, because it was mostly surrounded by a background of white clouds. The Great Red Spot is best seen between about an hour before and an hour after it crosses Jupiter's central meridian, as Jupiter rotates on its axis. In this image, the Great Red Spot was visible while Jupiter's moon Ganymede was transiting across the face of Jupiter. The moon's shadow appears as a distinct black spot just to the right and slightly below the transiting moon. Usually, Jupiter's moons blend into the cloud background and are difficult to see while transiting. However, in this image, Ganymede is visible, and surface markings on Ganymade are barely discernable as well. 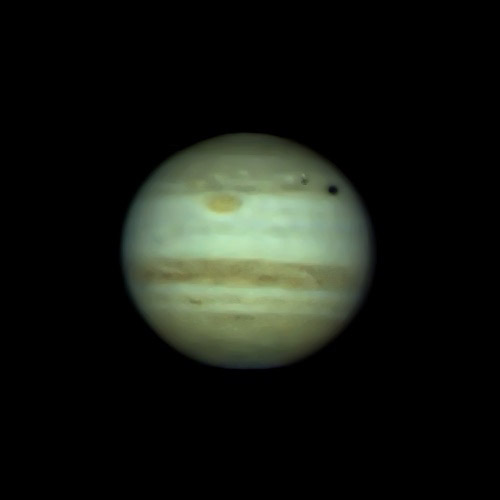 The pale Red Spot Junior (Oval BA) can be seen to the upper left of the Great Red Spot. This image was taken a few minutes after 1:00 o'clock a.m. local time on September 25, 2010. Jupiter reached opposition on September 21, so this image shows the Jovian planet just a couple of days past opposition. In 2010, Jupiter came closer to Earth than any other opposition between 1963 and 2022. However, the difference was only 1% or 2% closer than 2009 or 2011. At opposition, Jupiter appeared 49.9 arc-seconds wide at its equator, and reached -2.9 magnitude. In this image, South is up. This image was taken with the RCOS 32-inch Schulman Telescope at the Mount Lemmon SkyCenter. This telescope is available to the public, and is used for regular public outreach programs sponsored by the University of Arizona.